Wow! Just WOW! Muse of Nightmares is even better than Strange the Dreamer: deeper, darker, twistier… did I mention “deeper”? I’m just completely floored yet again by Laini Taylor’s imagination and lyrical prose. The lady can write! As in Strange the Dreamer, everything just pops. 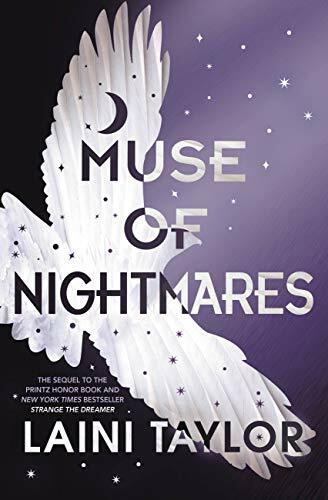 (If you haven’t read Strange the Dreamer, go buy it, read it, and then come back here, because Muse of Nightmares is not a standalone novel.) So many storylines intertwine in this tapestry of madness and redemption. It is incredibly satisfying to see how many characters twine their way through the story strengthening the whole vibrant tapestry. Muse of Nightmares starts with Kora and Nova, sisters writing their story separated by worlds and time from Sarai, Lazlo, and the others. They too, are like orphans, clinging to each other in a world of drudgery. They wait for the Mesarthim to return and test them, so they can be chosen to be Servants as their mother was. It’s the dream they’ve held onto all these years. They were meant for better than this. This is not their life. It couldn’t be. They were meant to be soldier-wizards. Then after an absence of many years, a starship comes. And everything changes. Sarai is dead. There’s no way around it. She’s the Muse of Nightmares, and yet her life – or death – has become a nightmare. She’s seventeen and she’s in kneeling beside her own body. Minya saved her, pulled her back from unraveling in death, keeps her from melting away, from evanescing. But even as Sarai hugs Minya, rejoicing that at least she still exists, if non-corporeally, she sees Lazlo Strange, her love. “She felt like a breath that had been inhaled into darkness, only to be exhaled again as song. She was dead, but she was music.” And then Minya speaks and the nightmare descends, because while Minya’s godspawn gift allows her to pull souls back from death’s grip, it also allows her to control them. What they do, what they say, all controlled. Minya has never grown past the six-year-old child that she was when Eril-Fane slew Skathis and the others. She’s the same size, she wears the same clothes, she feels the same hate that she did years ago as she fled the slaughter with the two babies and two small toddlers that were all she was able to save. She has never left the memory of the murdered babies in the nursery behind. She lives that memory and hates with every single breath. Now Sarai is Minya’s hostage to make Lazlo behave, to make Lazlo obey. She wants nothing more than to descend on Weep, the city below their floating home, and destroy every single human. While Sarai is rejoicing that they are free of their skyborn prison, Minya doesn’t want to be free; she wants to be a monster. Can Sarai ever be escape Minya’s plan? Can she still be the Muse of Nightmares even if she’s dead? Muse of Nightmares winds the story of Kora and Nova around the story of Eril-Fane, Lazlo Strange, Sarai, Minya, and the others. The novel shines with incredibly detailed and believable characters, blisteringly real world-building, and a story that echoes the human condition as two sisters reach across worlds toward each other, struggling to unite. It’s a story of heroes and monsters: heroes who become monsters and monsters who become heroes. Love, PTSD, shame, guilt, fear, horror… almost everything that anyone could ever feel is woven through a timeless tale. We live for love, we kill for love, we change for love… we hate when love is lost to us. The story feels as if every Greek myth infused a body, sat down by a bonfire, and mesmerized everyone else sitting there with a horror story as the night grew dark around them. But for every night, a dawn rises, and flickering through all the pain and darkness in Muse of Nightmares, shimmers of light touch a face, a hand, and gradually reveal the speaker and their audience. Frightened. Heartbroken. Hopeful. Changed. I’m trying not to include spoilers, so I’ll simply finish by saying Laini Taylor is a writer that will grab your attention and yank your heart around. Phrases will resonate with you long after you put the book down, as will many aspects of the story. I was sorry when the book was done and there wasn’t another to journey on with. Not that there were any cliffhangers, it was just like having your favorite people in the whole wide world walk out the door and you don’t know when or if you’ll see them again. But you wish they would take you with them on their next adventure. Highly recommended for those who love fantasy, lyrical yet unpretentious prose, and simply brilliant storytelling.